Whitney Houston wanted to be Mrs Michael Jackson. She wanted to marry the King of Pop and become the undisputed Queen of Pop. So when she couldn’t get her claws into MJ she went after his brother. It’s now been revealed Whit and Jermaine Jackson were more than good friends – they had a year long affair while he was married. According to The Sun she hooked up with Jermaine around 1984 when she was on the verge of super stardom. She’d always had her eye on his younger brother Michael but when he didn’t show any romantic interest she set her sights on the older Jermaine. She wanted to make Michael jealous and thought seeing his brother would do the trick. It didn’t. Michael found out about the affair and didn’t approve. But Whit ended up falling hard for Jermaine. It ended when he wouldn’t leave his wife for her. He is said to have inspired one of her early videos for the song Saving All My Love For You. Coincidentally the song is about a woman who’s in love with a married man. There was even a Jermaine lookalike playing the guy in the music video. He’s always been open about their friendship – he even discussed it in his book last year – but never admitted they ended up as lovers. The two stayed in touch. They spent a lot of time together when Michael died in 2009. 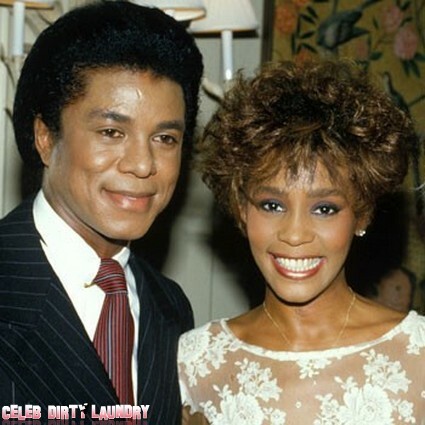 Jermaine is said to have been inconsolable when he heard about Whitney’s passing. A source telling the paper ‘‘Her death has devastated Jermaine because of the history between them. No one understood the scale of his grief because they didn’t know what they shared.‘ We do now.